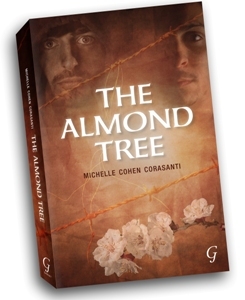 Reading The Almond Tree, a Kite-Runner-like epic of Palestinian life by Michelle Cohen Corasanti, makes you aware of what it’s like to exist under Israeli rule. Put yourself in the shoes of Ichmad Hamid, a young boy growing up in a Palestinian village in the year 1955. No, sorry, that’s something you can’t do. Ichmad’s family, living in a village under Israeli military rule, is so poor that they can’t afford shoes for the children. Wearing sandals cut out of discarded tires, Ichmad plays with his brothers and sisters while his father earns a pittance building homes for the Jews in a nearby moshav. There is an open field near the family’s house, close to the Jordanian-controlled West Bank. The Israeli army has planted land mines in the field in efforts to stop infiltrators from crossing the border. But in the eyes of Ichmad’s two-year-old sister, the field looks like a great place to play. The result of her frolicking is tragic, setting the stage for other tragedies and misfortunes that will befall the family over the years. This is Ichmad’s narrative, told in the first person. The events of his life are relayed by a young boy, then by a university student in the tense time just before the outbreak of the Six Day War. We follow Ichmad as his brilliant scientific mind leads him to achievements and a far better life than what results from the choices made by his brother, Abbas, who sides with terrorists seeking to strike back at Israel by any means possible. This will not be easy reading for Israelis and Jews elsewhere, but it should be required reading. The pain and suffering described are that of the Palestinian protagonist. The victims of Palestinian terrorism are not mentioned because they play no role in Ichmad’s life. The narrative is clearly one-sided, but it is a side that is unknown to the Israeli public. Any chances of reconciliation and peaceful relations between Israelis and Palestinians depend on hearing and understanding what has taken place on the other side, and this is true on both sides. The Almond Tree is not the first literary attempt to tell the Palestinian narrative. Earlier books with similar themes include Mornings in Jenin by Susan Abulhawa and I Shall Not Hate by Izzeldin Abuelaish. What sets this book apart are two things. First, there is an underlying message of hope, that the tragic suffering can end and peace can be achieved. As Ichmad’s father tells him, “I pray our people and the Jewish Israelis will one day work together to build up the country, rather than destroy it.” And this wish is echoed by the Israeli professor with whom Ichmad collaborates on scientific research. “We need to stop fighting and start building.” Ichmad’s choices in life, to better himself and his family through education and cooperation with Israelis, should serve as examples to all. The second thing that makes this book special is its author. Michelle Cohen Corasanti grew up in a Jewish American home, studied in a Hillel Yeshiva grade school, and later came to Israel for seven years, studying at the Ben Shemen Boarding School before getting her BA in Middle Eastern Studies at Hebrew University. She continued with Middle Eastern Studies with an MA from Harvard, and studied law and Arabic. The one question that stood out in my mind after reading this powerful work of fiction was why would an American Jew with a strong connection to Israel end up writing a heartrending tale of Palestinian suffering? The answer to that question is included in an exclusive interview with Michelle Cohen Corasanti, my next blog post.